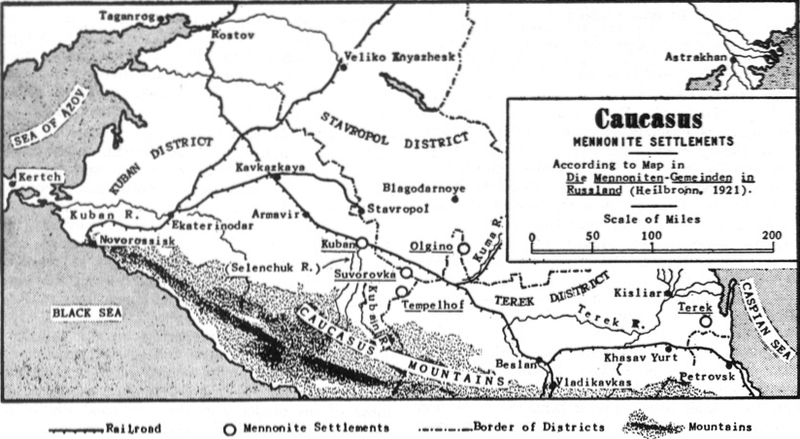 ... the Caucasien region called Kuban, where all the settlers in two villages belonged to the Mennonite Brethren Church. It was close to the Kuban river. Six miles from the village Nevinomysk where some had already settled several years ago. The two villages are: Wohldemfurst and Aleksanderfeld, they belong to the Batalgoshin district. I [Jacob Kroeker] also attended the same school for two years, and in the fall of September of 1873, took the leadership of the school in Aleksanderfeld in our new settlement, and served 9 years until March, 1882. Katharina [Voth who married David A Friesen] (3 July 1914, Russkoje, Terek, South Russia – 14 July 1985, Clearbrook, British Columbia, Canada) was the daughter of Hermann H. Voth (27 March 1882, Alexanderfeld, Kuban, South Russia – 16 December 1954, Chilliwack, British Columbia, Canada) and Maria (Retzlaff) Voth (25 July 1886, Konteniusfeld, Molotschna, South Russia – 7 January 1933, Morden, Manitoba, Canada).